After the application the hydroseed needs to dry completely, to allow the taking agents to cure. Watering correctly and maintenance is very important in establishing a healthy lawn, if you follow these instructions below you will have great results in about 4-5 weeks. Watering correctly is very crucial especially when the seed is germinating. During the first 2-3 weeks watering 3-4 times a day is recommended 10-15 minutes per time, keeping the hydroseed moist at all times. Do not over water the hydroseed by allowing areas to puddle or become soggy. Keep in mind on rainy, windy or extremely hot days you may need to adjust your watering schedule. 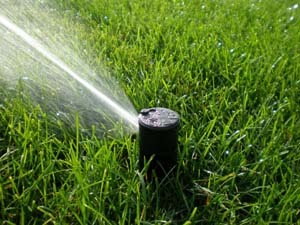 Once the grass reaches a height of about 1” you can reduce your watering to 1-2 times per day. After the first mowing watering once a day thoroughly allows for a deep healthy root system. Mature lawns need only 1” of water a week to survive and should be watered early in the morning and not late at night where this may cause lawn diseases. A new lawn should be mowed as soon as the grass blades are 2” to 3” tall a good rule of thumb is to never mow off more than one third of the grass blades during a cutting. Keep the mower blades sharp to prevent the grass from tearing, be sure to cut the grass when the ground is dry being especially careful when turning. The grass roots are not yet fully established and may be easily torn out of the ground. A high phosphorus fertilizer has already been mixed into the hydroseed, do not apply any additional fertilizer for 3-4 weeks. After this period you should contact your lawn care professional and have them recommend a fertilizer program for you. A good fertilizer program is critical when establishing a new lawn. There will be some weeds in any newly seeded lawn. Unfortunately the weeds were already present in your soil. Preparing the soil for seed caused these weed seeds to surface allowing them to germinate. These weeds are best left alone, most of them are annuals and will die off the next season. It’s more important to establish and thicken the grass as quickly as possible preventing the weeds from invading. Do not apply a weed killer or weed and feed product on your newly seeded lawn, until you have mowed it at least 3 times. If these weeds are still a problem, consult your lawn care professional with any further weed problems. We use only the best materials and effective practices available to us in the industry. We guarantee our hydroseed to grow under our specific care and watering instructions. After the area is hydroseeded it is your responsibility to provide the proper maintenance needed. We can not guarantee the end result of the hydroseed area because the care and weather conditions are beyond our control. Fraaza Enterprises Inc. is not held responsible for any damage due to severe weather conditions, but we will reapply any damaged hydroseed area at a negotiable price less than the original amount.